What makes the earth so beautiful? The interplay between the light from the Sun and the white, blue, green, and brown colors from the Earth which produce incredible vistas from mountain tops and space. The ocean and atmosphere, the grasses and forests, the mountains and deserts, and the clouds and snow reflect, absorb, and scatter various colors of the rainbow. For example, during the day, blue light is selectively scattered by the atmosphere to form a beautiful, blue canopy of light. The stars are blotted out and the atmosphere is visible. But, at night, only a minor amount of light from the Moon and stars is scattered permitting one to see through the atmosphere to the stars in space. The reflected light from clouds and glaciers contrast strongly with the blue of the atmosphere and ocean. God has truly given us a beautiful place to call home. But, in today’s skeptical culture in which many deny the existence of God or question his declarations in Scripture that He created the atmosphere on the second day of Creation and the ocean on the third day just a few thousand years ago, it is not enough to refer to beauty and design as evidence of His creative power and refer to the Bible as the record of His activities. Many now demand that independent evidence of a recent origin must be gleaned from the ocean and atmosphere directly to validate what Scripture says. Fortunately, a resurgence of quality research grounded on Biblical revelation has developed over the last twenty years or so. A number of PhD scientists with training in the atmosphere and ocean sciences and committed to a young earth have devoted full and part-time efforts to understanding processes which reveal estimates of rates and timing. This chapter will survey the current status of evidence of a few of the arguments for a young ocean and atmosphere. About 2/3 of the surface of the Earth is covered by an ocean of water. The water fills the deepest trenches on earth to about 35,000 feet below sea level. Only the mountains and higher terrain extend above sea level. The amount of water in the ocean is sufficient to cover the entire Earth to a depth of about 8,000 feet if the surface of the earth was completely smooth. Earth is unique among the planets of the solar system because it currently exhibits the only liquid water on any planet at the surface. A small amount of water exists on a few of the other planets in either gaseous or frozen form, but only the Earth has liquid water. The temperature of the other planets is either too cold or too hot to maintain water in liquid form. Liquid water is necessary for most life processes on the Earth and explains why the planet is so fertile. Some of the other planets like Mars may have contained liquid water in the past as evidenced by erosional features, but this water has either evaporated and escaped to space or is trapped in the crust in frozen form. Liquid water is a very unique substance. It makes life processes possible, it is a universal solvent, it stores large amounts of heat, it absorbs or releases large quantities of heat during phase changes, and it is denser than the solid state. Each of these properties is important, but probably, the most significant property for a discussion of the interplay between the ocean and the atmosphere is the massive influence the ocean has on the atmosphere. The ocean’s mass is almost 2,500 times greater than that of the atmosphere and its specific heat is about 4 times greater, so the ocean contains approximately 10,000 times more energy than the atmosphere. This means that long-term thermodynamic processes in the ocean essentially “drive” those in the atmosphere. For example, the current concern about global warming is focused on changes in the temperature of the atmosphere caused by measured increases in carbon dioxide over approximately the past 50 years. Modeling studies assume the increase in concentration of carbon dioxide since 1958 will lead to an increase in the average global temperature of some 10 oF over the next 100 years. Such a large increase in average temperature would be of concern if it were to happen. But, models used to generate this dire prediction assume the increase in carbon dioxide is due to man’s activities and that the atmosphere is not coupled to the ocean. In fact, it is likely that the ocean is releasing a large percentage of the increased concentration of carbon dioxide due to the ocean’s ability to dissolve and store carbon dioxide. A very small increase in ocean temperature will release a massive amount of carbon dioxide and overwhelm any variation introduced by industrial processes. In addition, the ocean will act as a massive thermostat to modulate temperature change in the atmosphere. The ocean is like a giant flywheel in the earth-atmosphere system. Neither of these effects has been seriously considered in the global-warming debate. Yet, there is evidence that the ocean was dramatically warmer in the past than it is today. It is commonly believed that during the Cretaceous Period, some 65 million years ago, according to the conventional evolutionary time frame, the average ocean temperature was much warmer than today—possibly as warm as 100 oF on the average. This temperature estimate is based on numerous methods including climate models and various paleothermometers (estimates of historical temperatures from proxy variables). However, the primary justification for this estimate is derived from sea-floor sediment data (Vardiman, 1996). Small microscopic organisms called foraminifera grow in the ocean and produce calcium carbonate shells (tests) which settle to the ocean floor when the organism dies. The shells contain different ratios of the isotopes of carbon (oxygen-18 and oxygen-16) depending on the temperature of the ocean in which they grew. Therefore, by analyzing the ratio of these two isotopes as a function of depth in sea-floor sediments an estimate of the average ocean temperature as a function of time can be made. Unfortunately, the conventional method for estimating how fast sea-floor sediments accumulate ignores the global Flood described in Genesis and seriously overestimates the amount of time during which the sediments formed. The conventional method dates the Cretaceous Period at 65 millions years and older giving a cooling trend for the average ocean temperature which is extremely slow—on the order of 1.5 oF per million years or less. On the other hand, if the majority of the sea-floor sediments were assumed to have accumulated following the Genesis Flood some 5,000 years ago, the cooling trend would be much faster—on the order of 8 oF per thousand years. There is even a hint of more rapid cooling immediately following the Flood followed by a decline in the cooling rate. This trend is more realistic than the conventional interpretations because actual cooling trends typically exhibit an exponentially declining cooling curve as a function of the temperature differential between a hot object and a cold thermal sink. As the temperature difference decreases the cooling rate decreases, as shown in Figure 1. So, the evidence for a warmer ocean in the past argues for recent, rapid cooling of young earth. In fact, the Genesis Flood also provides an explanation for why the ocean was warmer during the Cretaceous Period. The warm ocean was a result of heat released during the catastrophic processes of the Flood. If the Genesis Flood was as catastrophic as the Genesis account implies and direct geologic evidence supports, tremendous quantities of heat would have been released from all the geologic activity which occurred during the year of the Flood. Hot, molten magma would have been released to form the 40,000-mile long mid-ocean ridges on the ocean floor all around the globe. Continents would have been separated and moved thousands of miles. Tens of thousands of volcanoes would have erupted. The entire crust of the earth would have been buckled to form mountains, mountain chains, and trenches over the surface of the earth. Hot water would have been released from the fountains of the deep and the windows of heaven. The heat from all this geologic work would have been mixed throughout the depth and horizontal extent of the ocean by the water covering all the highest mountains during the early stages of the Flood and then retreating from off the continents at the end. So, the Cretaceous Period would probably have been the result of the catastrophic Flood processes. The conventional model for the Cretaceous Period has no generally accepted explanation for the source of heat that would cause the oceans to be as warm as 100 oF. If the ocean temperature was warmer following the Genesis Flood than it is today, as indicated by these data, it is likely that a massive El Niño effect would have been present for several thousand years after the Flood. An El Niño event is a periodic warming of the ocean along the West Coast of the North and South American continents during which increased evaporation and heat flow from the surface of the ocean into the atmosphere energizes storms traveling across the Pacific onto the continents. These energetic storms produce severe weather along the coasts and redistribute precipitation patterns around the world. More snow typically falls in the mountains and rain falls at lower elevations causing local floods. Typically, El Niño events occur today with a periodicity of 7-10 years and produce a warming of the sea-surface temperature by 1-3 oF. Figure 1.Temperature decrease with time following the Genesis Flood derived from 18O/ 16O ratios in the shells of microscopic marine organisms. Following the Genesis Flood the average ocean temperature may have been initially as warm as 100 oF worldwide throughout the depth of the ocean. This is considerably warmer than the average temperature of about 40 o F today. The heat generated by the Flood would have been mixed throughout the ocean from the poles to the equator and from the sea surface to the sea floor. Today the sea-surface temperature only approaches 100 oF near the equator. The sea-surface temperature in the polar regions and the water at the bottom of the ocean from the poles to the equator can actually be colder than 32 oF because the water is salty and can be cooled below the normal melting temperature of pure ice. The current distribution of ocean temperature was produced since the Flood by the movement of hot water at the equator toward the poles, cooling to the atmosphere and space by radiation, sinking to the bottom of the ocean, and moving back toward the equator along the ocean floor. A tremendous quantity of heat was removed from the ocean in this process. At the same time large quantities of water were evaporated from the warm ocean and transported onto the continents were it was recondensed as rain and snow. The snow preferentially fell in the polar regions and on mountain tops over a period of less than 1,000 years. Glaciers and ice sheets formed quickly in this process producing the ice age which is conventionally thought to have occurred multiple times and taken about 100,000 years each time. The equivalent of 200-300 feet of water over the entire ocean is believed to have been removed from the ocean to the continents lowering the average sea level and exposing continental shelves worldwide. Shallow land bridges between Asia and Alaska and between Southeast Asia and Australia were exposed permitting easier migrations of people and animals from one continent to another following the Flood. Dozens of explanations have been proposed for the cause of the ice age by conventional scientists, but all of them have excluded the Genesis Flood. The explanations vary from a reduction in the solar output of the Sun to bursts of metorite bombardment, increased volcanic activity, to periodic fluctuations in the heating by the Sun due to minor changes in orbital parameters. None of the conventional explanation have been successful in fully explaining the ice age. This is primarily due to the fact that none of them have included an adequate explanation for transferring such large quantities of water needed to form the ice sheets from the ocean to the continents under cold, ice-age conditions. Cold air present during the ice age would not have been able to hold sufficient water vapor to produce large amounts of snow and ice. An old adage is often applied by old timers to the lack of snow on really cold days in the winter—It's too cold to snow! A catastrophic solution which provides a source of water to form snow is needed to explain the ice age. A hot ocean following the Genesis Flood solves this problem. Surprisingly, a hot ocean also produces another effect which was only recently discovered. Large, intense hurricanes, called hypercanes, may have formed during the millenium following the Genesis Flood when the sea-surface temperature was very hot. A sea-surface temperature warmer than 90 oF is often stated as one of the conditions for a tropical depression to grow into a hurricane. Today this condition only occurs in the tropics during late summer. The warmer the sea-surface temperature, the faster a tropical storm will intensify and the stronger it will become. Emanuel (2005) has proposed that at even higher temperatures a hurricane will continue to grow and intensify into a hypercane. Vardiman (2001) found that for sea-surface temperatures as high as 120 oF hypercanes can grow to hundreds of miles in diameter, produce horizontal winds of over 300 miles per hour, vertical winds of 100 miles per hour, and precipitation rates greater than 10 inches per hour. Figure 2 shows an example of such a hypercane was simulated in the Gulf of Mexico when the ocean surface was artificially maintained at a high temperature. Figure 2. 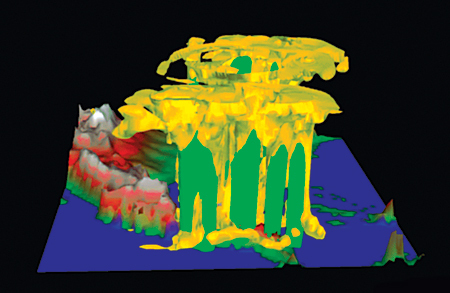 Numerical simulation of a giant hurricane (hypercane) in the Gulf of Mexico which grew when sea-surface temperature was artificially maintained at 120 o F. The yellow regions are cloud water and the green regions are rain. Hypercanes following the Genesis Flood would have contributed to the accumulation of snow and ice in polar regions and on mountain tops and produced massive erosion of the bare unconsolidated landscape of the continents following the Genesis Flood. Because the low-level atmospheric winds which steer a hurricane generally flow from East to West in the tropics, as they do today, most of the erosion would have occurred on the eastern coasts of the continents at low latitudes. Few hurricanes affect the mid latitudes today because the oceans are too cold poleward of about 30 o latitude. However, immediately after the Flood the oceans would have been hot enough worldwide to support hurricanes and even hypercanes for hundreds of years. In mid latitudes where the low-level winds flow from West to East, the erosional features would have occurred on the western coasts of continents. In high latitudes where the low-level winds also flow from East to West, the erosion would have occurred on the eastern coasts of the continents. Temperature changes are not the only window on the history of the ocean. Another piece of evidence arguing for a young ocean relates to the amount of salt it contains and the rate at which it was added. Austin and Humphreys (1990) conducted an inventory of the amount of Na + in the ocean (the positive ion from salt) and found that by making assumptions most favorable to an old-age, evolutionary model, such as no initial Na + , minimum input rates, and maximum output rates, the oldest ocean calculated was 62 million years. This is almost 75 times less than the 4.5 billion years for the conventional estimated age of the earth. The calculated age can easily be accomodated into a young, creationist model when non-zero initial concentrations of Na + and the likely affects of the Genesis Flood are considered. Na + is the most common dissolved metal in the ocean. The worldwide delivery of Na + to the ocean by rivers has been recognized by scientists for hundreds of years (Halley, 1715). Until the early 1900's salt in seawater was thought to be a legitimate method for estimating the age of the earth. However, with the discovery of radioisotope dating which gives age estimates of 4.5 billion years, the concentration of Na + was believed to give an estimate of residence time rather than the age of the earth. Residence time is the average length of time the sodium ion would survive in the ocean before being removed. This steady state model of salt in the ocean says that Na + is removed from the ocean about as fast as it enters, causing the amount of Na + in the ocean to remain roughly constant with time (Rubey, 1951). Austin and Humphreys (1990) compared the magnitude of the input and output rates of Na + to determine if the model is close to being in steady state. They computed the minimum input from eleven sources of Na + to the ocean including rivers, sediments, atmospheric and volcanic dust, glaciers, ground water, and hydrothermal vents and seven sinks of Na + from the ocean including sea spray, cation exchange, pore water, halite deposition, basalt alteration, and albite and zeolite formation. They found a minimum input rate today of 457 billion Kg/year and a maximum output rate of 122 billion Kg/year. Only 27% of the Na + going into today's ocean can be accounted for by known output processes. A separate study by Drever, et al. (1988) showed that the negative ion Cl - is also being added to the ocean at a much faster rate than it is being removed. Therefore, the ocean is not presently in a steady state condition and the age of the earth must be less than 62 million years. A maximum age of 62 million years still seems like an extremely long period of time compared to a Biblical age of thousands of years. But, remember, the study by Austin and Humphreys (1990) went overboard to give the evolutionary time scale the benefit of the doubt. The estimated age still falls far short of the assumed conventional age of the earth. However, if one were to factor in Biblical arguments, this number would be reduced significantly, likely down to only thousands of years. For example, there is no reason to assume the ocean didn’t already have dissolved salts when it was formed. Many of the fish and other creatures which live in the ocean today require salt water to survive. They would likely have been able to adapt to a more salty environment but probably not to the level of concentration observed today if it was originally fresh water. So, a major reduction in the estimated age of the ocean could be due to the ocean’s initial condition already containing large concentrations of Na + . 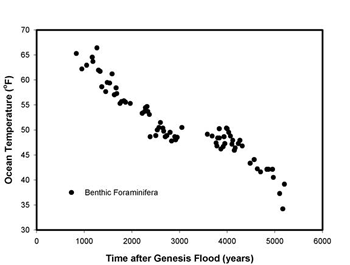 There may be methods for estimating the initial concentration of salt in sea water by analyzing fossil fish or other organizations which died during the Genesis Flood. Their bodies may exhibit mechanisms or residual evidence of antediluvian conditions. There may also be other techniques for analyzing samples of pre-Flood conditions such as fluid inclusions in vesicles of pillow lava. Vesicles are small glass bubbles formed when magma cools. Pillow lava formed underwater would likely capture small samples of sea water which would have retained the characteristics of the water when it was trapped. Of even more importance is the likely addition of major quantities of salts during the Genesis Flood. If the Flood is as catastrophic as the Bible states in which “all the high hills were covered”, it is probable that the Flood would have caused global devastation of unimaginable magnitude. There was no such thing as a calm, worldwide Flood. And, the geologic record exhibits evidence for an incredible global catastrophe in which the earth’s entire ocean and the crust were involved. About ¾ of the earth’s land surface is covered with sedimentary rock formed during the Genesis Flood when material from the crust was pulverized and mixed into the ocean, finally settling to the bottom to form sediments which turned into rock when the water retreated from off the land. During the process in which rocks, gravel, sand, and muds rained through the ocean to form sediments on the ocean floor the ocean was leaching salts and minerals from the materials. Dissolved salts and minerals were left in the water after the Flood contributing to the load of Na + and other ions we find in the ocean today. So, it easy to see that the ocean must be much younger than the conventionally assumed age and very likely supports an age of thousands of years if earth history as recounted in the Bible is taken literally. Like the ocean the atmosphere contains evidence of past geophysical processes. Instead of dissolved solids like the ocean, the atmosphere contains concentrations of minor permanent gases which help us understand past chemical and nuclear processes. The atmosphere is composed mostly of nitrogen (~78%) and oxygen (~21%). It also contains much smaller concentrations of many other chemically active gases such as carbon dioxide and the noble gases argon (~1%), neon, helium, krypton, and xenon which are inert ( Walker, 1977). These noble gases are particularly useful because they do not participate in chemical reactions and their concentrations can help to quantify the types and rates of nuclear processes. For example, the radioactive element uranium-238 is commonly present in many crustal rocks and forms helium when it disintegrates by nuclear decay. As the helium leaks from the rocks in the crust of the earth it escapes into the atmosphere where its concentration has been used to estimate how long the rocks have been decaying. Helium is a relatively light gas and a small amount can escape earth’s gravitational field when it is ionized and accelerate upward by what is called the polar wind. For several years before the magnitude of the polar wind was determined Vardiman (1990) reported that the lack of helium in the atmosphere argued for a young earth. That argument is no longer valid based on the measured and computed escape rate of helium to space in the polar wind. However, the large concentrations of helium remaining in crustal minerals is still a strong argument. Humphreys (2005) has presented an air-tight case that the earth is 6,000 ± 2,000 years based on the residual concentration of helium in zircon grains of granites and the rapid diffusion rate of helium from them. Another gas which could be used for this calculation is argon. It is produced by the decay of uranium in the rocks of the earth. Argon contributes the largest amount of any of the minor gases to the atmospheric composition. It is also massive enough that it will not escape to space by any conceivable mechanism. Its concentration should then be directly related to the amount of nuclear decay in the rocks of the earth. However, quantifying the amount of time based on the amount of argon in the atmosphere has several complexities which make it difficult to use. First, the rate of escape from the crust to the atmosphere is uncertain. Because argon is such a massive atom, it is also relatively large compared to other gases like helium. It is harder for such a large atom to diffuse from the crystalline structure in rocks where it is formed and, thus, should have a slower escape rate from the crust. Diffusion rates of argon from various minerals need to be validated. Second, Vardiman et al. (2005) found that nuclear processes in rocks of the earth have been accelerated during episodes in earth history which make invalid a simple calculation of the age of the earth based only on the concentration of argon in the atmosphere divided by an assumed constant production rate. The large amount of argon in the atmosphere argues for a large amount of nuclear decay, but not necessarily a long period of time. And, third, like most geochronometers, the problem of the initial concentration of argon needs to be dealt with. Once again, it is not necessary to assume a zero concentration of argon in the atmosphere at its origin. It is becoming more and more evident that many geophysical arguments from the ocean and atmosphere support a young earth. In fact, conventional explanations for an old earth must often beg the question by special pleading and ignoring conflicting data. Many processes like heat and salt in the ocean and helium and argon in the atmosphere argue directly for a young earth. Some of the estimates for the age of the earth can even be quantified when catastrophic processes revealed in the Bible are considered. So, the age-of-the-earth problem is not so much one of forcing science and the Bible to agree, but rather, one of believing the Bible to establish the proper scientific questions. The future of creation science is bright due to so many highly-trained scientists who have confidence in the Bible now working on such problems. Austin , S.A. and D.R. Humphreys, The Sea’s Missing Salt: A Dilemma for Evolutionists, Proceedings of the Second International Conference on Creationism, Creation Science Fellowship, Inc., Pittsburgh, PA, pp. 17-33, 1990. Drever, J.I., Y.H. Yi, and J.B. Maynard, Geochemical Cycles: the Continental Crust and the Oceans in Gregor, C.B., R.M. Garrels, F.T., Mackenzie, and J.B. Maynard, eds., Chemical Cycles in the Evolution of the Earth, John Wiley, New York, NY, pp. 17-53, 1988. Emanuel, K., Divine Wind: The History and Science of Hurricanes, Oxford University Press, 285 pp., 2005. Halley, E., A Short Account of the Cause of the Saltness of the Ocean, and of the Several Lakes that Emit No Rivers; with a Proposal, by Help Thereof, to Discover the Age of the World, Philosophical Transactions of the Royal Society of London, Vol. 29, pp. 296-300, 1715. Humphreys, D.R., Young Helium Diffusion Age of Zircons Supports Accelerated Nuclear Decay, in Vardiman, Snelling, and Chaffin (eds. ), Radioisotopes and the Age of the Earth: Results of a Young Earth Creationist Research Initiative, Institute for Creation Research, San Diego, CA and Creation Research Society, Chino Valley, AZ, 848 pp., 2005. Rubey, W.W., Geologic History of Seawater: An Attempt to State the Problem, Geological Cycles in The Evolution of the Earth, John Wiley, New York, NY, pp. 5-16, 1988. Vardiman, L., The Age of the Earth’s Atmosphere: A Study of the Helium Flux through the Atmosphere , ICR Technical Monograph, Institute for Creation Research, San Diego , CA , 1990. Vardiman, L., Sea-Floor Sediments and the Age of the Earth, ICR Technical Monograph, San Diego , CA 94 pp., 1996. Vardiman, L., Climates Before and After the Genesis Flood: Numerical Models and Their Implications, ICR Technical Monograph, Institute for Creation Research, San Diego , CA , 2001. Vardiman, L., A.A. Snelling, and E.R. Chaffin (eds. ), Radioisotopes and the Age of the Earth: Results of a Young Earth Creationist Research Initiative , Institute for Creation Research, San Diego, CA, and the Creation Research Society, Chino Valley, AZ, 848 pp., 2005. Walker, J.C.G., Evolution of the Earth’s Atmosphere, Macmillan Publishing Co., Inc., New York , NY , 318 pp.